As agreed by China and France, the 5th China-France High-level Economic and Financial Dialogue will be held in Beijing from November30 to December 1. Vice Premier Ma Kai and French Minister of the Economy and Finance Bruno Le Maire will co-chair the Dialogue. The China-France High-level Economic and Financial Dialogue is a high-level dialogue mechanism, whose establishment was announced in 2013 by the two heads of state, with the aim to conduct dialogue between the two countries on strategic, overall and long-term major issues in economic and financial fields, advance China-France economic cooperation and scale the close and sustaining China-France comprehensive strategic partnership to a new height. As agreed by the two sides, the 5th China-France High-level Economic and Financial Dialogue will be carried out under the theme of "injecting new impetus into the close and sustaining China-France economic and financial comprehensive strategic partnership". 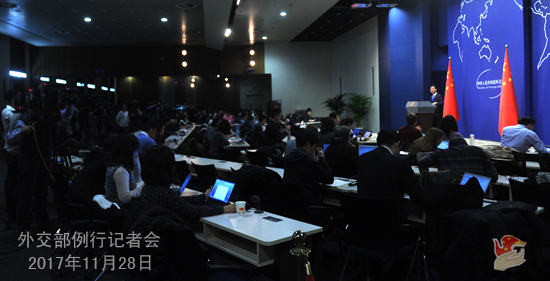 Discussions will be held on macroeconomic policy and global economic governance, trade investment and advanced manufacturing innovation and cooperation, financial market development and financial oversight cooperation, the impact of technological progress on growth, employment and fairness, etc. 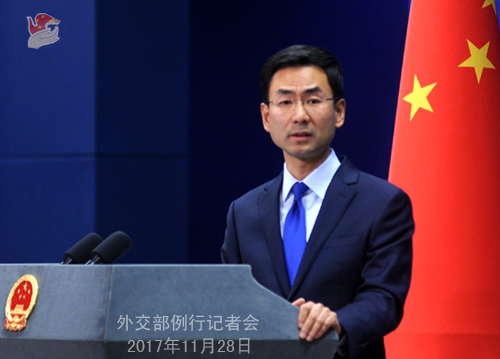 At the invitation of the government of the Republic of Zimbabwe, Assistant Foreign Minister Chen Xiaodong will pay a visit to Zimbabwe as the special envoy of the Chinese government from November 29 to 30. China and Zimbabwe enjoy traditional friendship. Since the establishment of diplomatic ties 37 years ago, the relations between the two countries have stood the test of time and ever-changing international landscape and maintained sound and steady development. The two sides have continued to enhance mutual political trust, achieved fruitful outcomes in various fields and brought tangible benefits to the two peoples. China values the traditional friendship between the two countries and stands ready to work with Zimbabwe on the basis of equality, mutual benefit and win-win cooperation for continuous sound momentum in China-Zimbabwe relations. Q: According to reports, China's National Tourism Administration today partially lifted the ban on trips to the Republic of Korea (ROK) by tourist groups in Beijing and Shandong. How do you comment on the resumption of tourist exchange between the two countries? A: I'm not aware of the information you mentioned. China remains positive and open towards exchange and cooperation in various fields with the ROK. We hope the ROK will work with China to create sound conditions for exchange and cooperation. Q: On November 27 local time, the US Department of Justice accused three Chinese citizens of involvement in hacking US companies since 2011. Do you have any response to that? A: I'm not aware of the information you said. China firmly opposes and cracks down hard on all forms of cyber attacks in accordance with the law. We have been stressing that cyber security is a global issue which calls for joint efforts of the international community on the basis of mutual respect, equality and mutual benefit and through dialogue and cooperation. Q: China today tried Lee Ming-che. Does that suggests China is going to take a harsher line with foreign NGOs in China? A: This is not a diplomatic question. The relevant authorities briefed on the case before and I will refer you to them. Q: We have noted that tens of thousands of travelers are stranded due to the volcanic activity in Bali. My question is specifically about the Chinese tourists. Have the Chinese diplomatic missions there made any arrangements or offered any assistance to them? A: The Chinese Foreign Ministry and diplomatic missions in Indonesia have been closely following the activities of Mount Agung and we have issued consular alerts to warn Chinese citizens to avoid going to the Bali island for the time being. They need to remain vigilant for their safety if they are already there, and avoid going anywhere near the volcano. In case of emergency, Chinese citizens are advised to report to the police immediately and contact the Consulate General in Denpasar without delay. 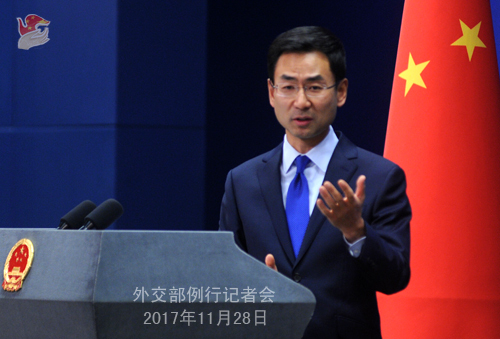 The Chinese Foreign Ministry and diplomatic missions in Indonesia will continue to release relevant information in time. Q: The Myanmar side has confirmed that its State Counselor and Foreign Minister Aung San Suu Kyi will pay a visit to China and attend the meeting of political parties shortly. Can you confirm that? A: I replied to a similar question yesterday. You may have noticed as well that the Communist Party of China (CPC) in Dialogue with World Political Parties High-level Meeting will be held in Beijing from November 30 to December 3. The International Department of the CPC Central Committee has already released the information and held press briefing on this meeting. So far as I know, political parties from quite a few countries will send representatives to the meeting. However, I don't have specific information about the participants of this meeting.